Our early afternoon was spent at the majour flea market held every Saturday. Azooza caught a scarf, while I caught caffeine. 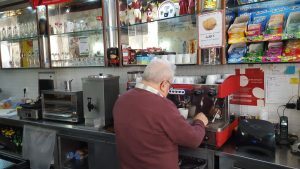 In Portugal, they might not recognize the request for either a caffè latte or a café con leche. Which means that for this morning, our first proper day here, my struggle was real. 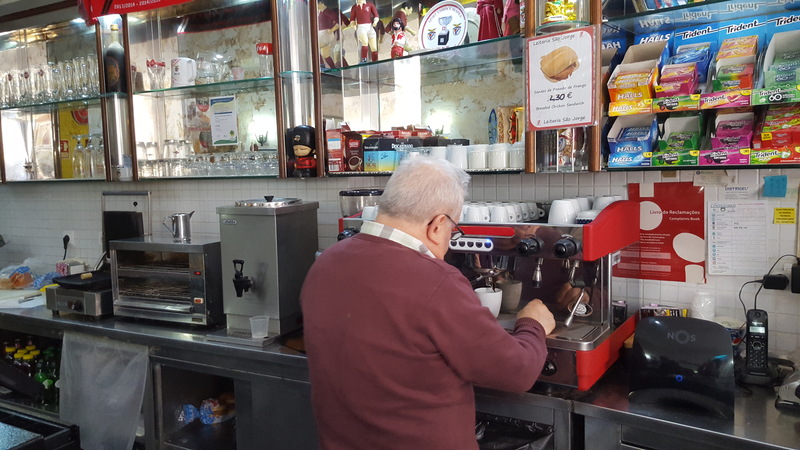 When I was served my second espresso in its espresso cups with a little splash of milk, my instinct wasn’t to Google translate, but rather to sadly wonder if the rest of my days in Portugal were going to be spent improperly caffeinated. Finally, at stop and try number three, this fine gentleman explained to me that that for which I am on the hunt is here called a meia de leite, pronounced my uh dlate (rhymes with mate). He owns Leitaria São Jorge (R. de Santa Cruz do Castelo 26). Look over his left shoulder and you will see a mini beefeater on the shelf, directly above the milk dispenser. It’s where he keeps his tips, accessed via slot in the top of its head. If it weren’t entirely inappropriate, I would have asked for a hug. 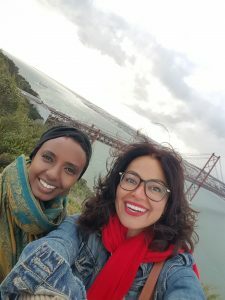 Along our way to São Jorge Castle (which we didn’t enter because the line-up was far too long), we found a woman singing “Ain’t No Sunshine When She’s Gone” from a small balcony. She had strung a bucket down for contributions, and her voice was heartbreaking, with the most unusual range and ring. I will let you know if I manage to eventually post a video to insta. Though it rained on and off, it finally subsided at around 4pm, which let us make our way over to The National Sanctuary of Christ the King, across the Teju River from Lisbon. I very much wanted Azza to enjoy the walk along the water from the ferry to the panoramic elevator, because every inch of all walls (but those along the two restaurants) is covered in graffiti. Sadly, though that remains the case, what is there now is – bluntly – cartoonish and ugly. The work three years back was just gorgeous. No matter. We made it in time and enjoyed the view, while noting that the Sanctuary seems to have become a place where people go to make out. FIVE COUPLES all loved up and loving it up at the feet of Christ. It felt a little out of place, but whatever turns people on, I guess. After coming back to Lisbon, and because it’s Saturday night, we decided to actually head out this one evening and enjoy a proper Saturday night. I had spied a lush velvet-filled situation and suggested we try it; which we did, and which we loved. It’s called Pensão Amor (R. do Alecrim 19), and it was all red, blue, and gold velvets, with chandeliers and mirrors everywhere. Even the seats were made to be sunk into. We left as it was turning from a sit-down cabaret (shows only on Tue & Wed) to a hands-in-the-air club. Highly recommended for when you’re in Lisbon, the pre-clubbing hours. Portugal, you are full of wonderful humans. 1. Dara’s stag in Lisbon, from Dublin. These men were glorious and entirely far too much fun. They joined Azza and me, and welcomed us into their little celebration as though we were a natural part of their many years long friendship. 2. That while huddling from the rainstorm that would every now and again pop out to say hello, I had a far too overdue catch-up with Janey, The Maha Whisperer. Always always always so heart-lifting to see that one’s face and hear her laugh. It is one of the best. 3. Having the use of a washing machine. Something we take for so much granted, when really it is a little luxury to have a washing machine in our homes.